One of the nine principles of fair trade (as defined by Fair Trade Federation) is "Respect Cultural Identity." I'd like to say Dunitz & Company absolutely embraces it! 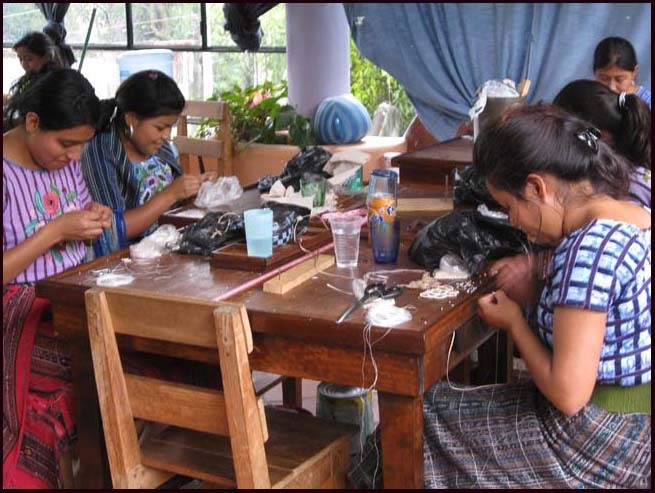 Our fair trade jewelry often communicates the essence of the community in which we work. When I first traveled to Guatemala in 1988, I was enthralled by the artistry of its citizens. Everywhere I turned artisans were painting, carving wood, weaving and embroidering. Bright colors were bursting everywhere. 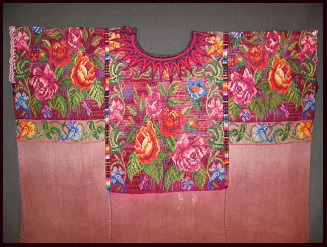 Although different in every village, the Mayan women dress in their own artistry. 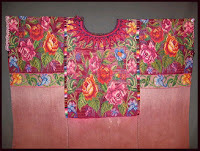 Traditional blouses (huipils) boast joy and nature. 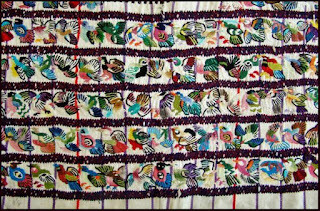 Check out this snippet from a Santiago Atitlan blouse, the community where our fair trade beaded jewelry is made. 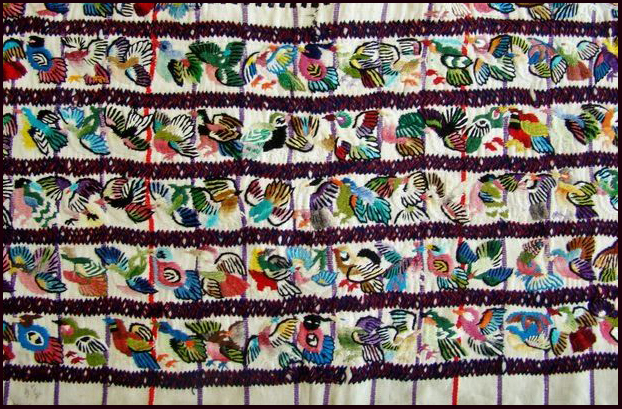 This one features dozens of various birds in an assortment of vibrant colors. Since this is an incredible skill many of our artisans possess, we embrace it. We encourage the women to put their traditional skills to task. And I'm sure many of you know what I mean. Dunitz & Company offers many fair trade jewelry designs that incorporate traditional Guatemalan embroidery. In recent years we learned of an unfortunate situation. 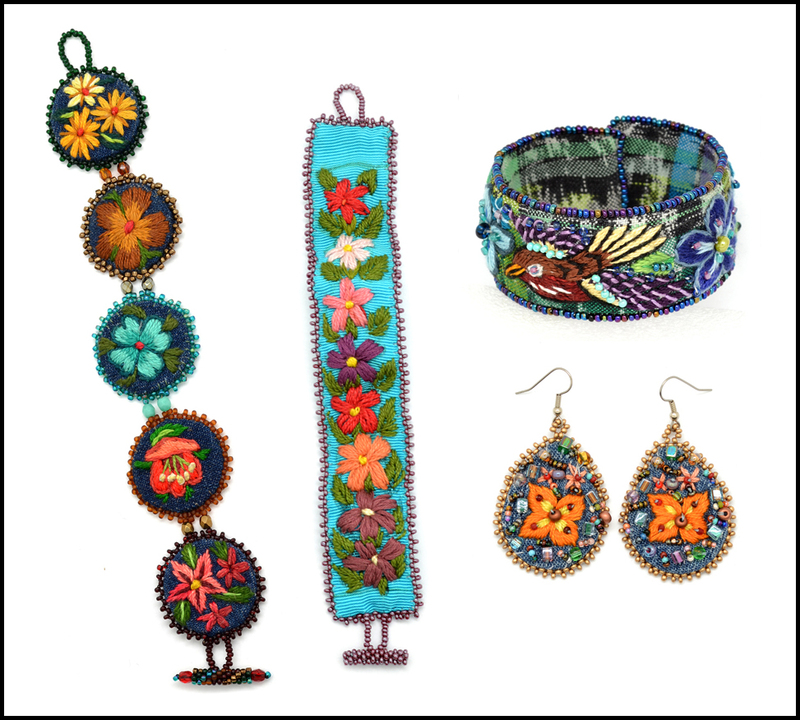 Many wholesalers of Guatemalan crafts actively sell hats, bags and anything you can think of made from what we were told were "recycled" skirts and traditional huipil blouses. We also created some bracelets and pins from old huipils we purchased at the local market. Ultimately we learned that poorer women were selling their traditional clothing years before they were worn out so they could earn enough money to feed their families. (Remember, western clothes can be purchased for pennies at the local markets.) The demand for these colorful crafts resulted in more and more women selling their family heirlooms. What makes it worse, is poor women would sell their treasures to middlemen who would then earn any and all reasonable markup made at the markets. Once we understood this, Dunitz & Company stopped buying older huipils and we discontinued creating the few designs that used them as components. We want to do everything we can to respect and protect cultural identity. Creating images of stunning flowers, birds and butterflies come very naturally to the community in which we work. 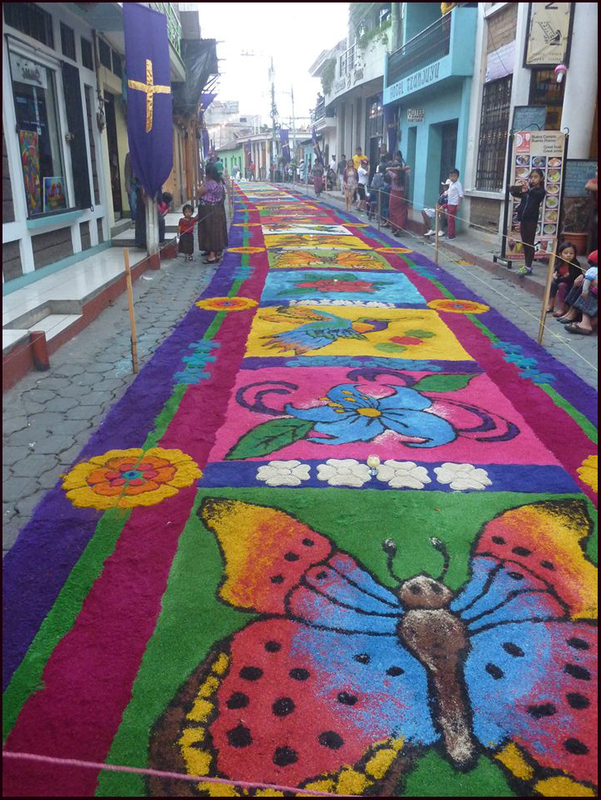 Colorful powder, bark, flower petals and you name it are components for carpets created to honor saints at various holidays. 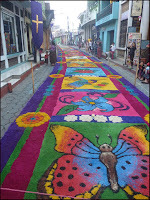 The carpet here was created for Easter Holy Week this year. How can you not embrace this? Yes, we respect cultural identity. And yes, we embrace it! We want these images as part of the jewelry we create.